Mammographic density is strongly and consistently associated with breast cancer risk. To determine if this association was modified by reproductive factors (parity and age at first birth), data were combined from four case–control studies conducted in the United States and Japan. To overcome the issue of variation in mammographic density assessment among the studies, a single observer re-read all the mammograms using one type of interactive thresholding software. 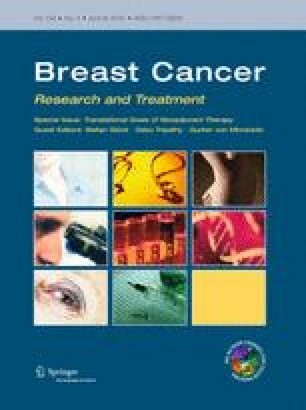 Logistic regression was used to estimate odds ratios (OR) while adjusting for other known breast cancer risk factors. Included were 1,699 breast cancer cases and 2,422 controls, 74% of whom were postmenopausal. A positive association between mammographic density and breast cancer risk was evident in every group defined by parity and age at first birth (OR per doubling of percent mammographic density ranged between 1.20 and 1.39). Nonetheless, the association appeared to be stronger among nulliparous than parous women (OR per doubling of percent mammographic density = 1.39 vs. 1.24; P interaction = 0.054). However, when examined by study location, the effect modification by parity was apparent only in women from Hawaii and when examined by menopausal status, it was apparent in postmenopausal, but not premenopausal, women. Effect modification by parity was not significant in subgroups defined by body mass index or ethnicity. Adjusting for mammographic density did not attenuate the OR for the association between parity and breast cancer risk by more than 16.4%, suggesting that mammographic density explains only a small proportion of the reduction in breast cancer risk associated with parity. In conclusion, this study did not support the hypothesis that parity modifies the breast cancer risk attributed to mammographic density. Even though an effect modification was found in Hawaiian women, no such thing was found in women from the other three locations. This research was supported by the National Cancer Institute, the US Department of Health and Human Services, grant number R03 CA 135699. CGW and SMC were supported for the completion of the study on this project through postdoctoral fellowships on grant number R25 CA 90956. Dr. Martin Yaffe is one of the founders of Matakina Technology, a manufacturer of software for the assessment of mammographic density. However, the software was not used in the present research, and neither the results nor the way the research was conducted has been influenced by Dr. Yaffe’s involvement in Matakina Technology.